In this tutorial, you add push notifications to the iOS quickstart project so that a push notification is sent to the device every time a record is inserted. If you do not use the downloaded quickstart server project, you will need the push notification extension package. For more information, see Work with the .NET backend server SDK for Azure Mobile Apps guide. The iOS simulator does not support push notifications. You need a physical iOS device and an Apple Developer Program membership. Register an app ID for your app. Create an explicit app ID (not a wildcard app ID) and, for Bundle ID, use the exact bundle ID that is in your Xcode quickstart project. It is also crucial that you select the Push Notifications option. Next, to prepare for configuring push notifications, create either a "Development" or "Distribution" SSL certificate. On your Mac, launch Keychain Access. On the left navigation bar, under Category, open My Certificates. Find the SSL certificate that you downloaded in the previous section, and then disclose its contents. Select only the certificate (do not select the private key). Then export it. In the Azure portal, select Browse All > App Services. Then select your Mobile Apps back end. Under Settings, select App Service Push. Then select your notification hub name. Go to Apple Push Notification Services > Upload Certificate. Upload the .p12 file, selecting the correct Mode (depending on whether your client SSL certificate from earlier is production or sandbox). Save any changes. Your service is now configured to work with push notifications on iOS. In Visual Studio, right-click the server project and click Manage NuGet Packages, search for Microsoft.Azure.NotificationHubs, then click Install. This installs the Notification Hubs library for sending notifications from your backend. If you haven't already done so, download the quickstart project or else use the online editor in the Azure portal. // Create a payload that contains the new item Text. // Execute the insert; Push as a post-execute action when results are returned as a Promise. When editing the file on your local computer, republish the server project. In QSAppDelegate.m, add the following handler methods. Your app is now updated to support push notifications. // Use userInfo in the payload to display an alert. // Create alert with notification content. // Get current view controller. Add file ClientManager.swift with the following contents. Replace %AppUrl% with the URL of the Azure Mobile App backend. In AppDelegate.swift, add the following handler methods. Your app is now updated to support push notifications. In Xcode, press Run and start the app on an iOS device (note that push will not work on simulators). Click OK to accept push notifications; this request occurs the first time the app runs. In the app, add a new item and click +. Verify that a notification is received, then click OK to dismiss the notification. You have now successfully completed this tutorial. Templates give you flexibility to send cross-platform pushes and localized pushes. 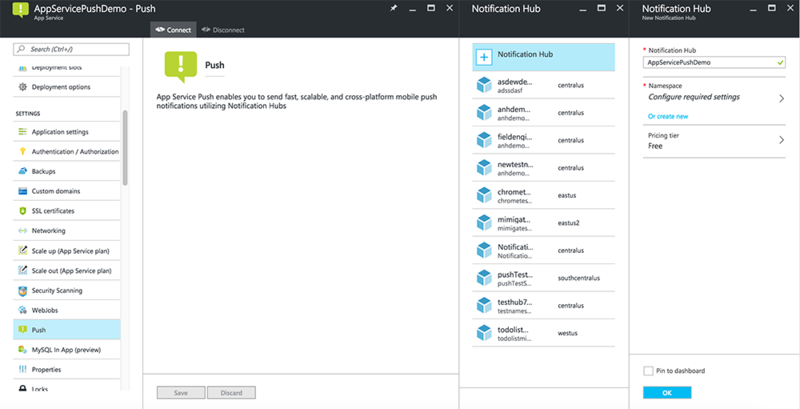 How to Use iOS Client Library for Azure Mobile Apps shows you how to register templates.